Harold slips in the kitchen and lands on his back, but as Lou goes to help him he slips over too and both are stuck on the floor. Susan's sister Liz is coming over. Elle is staring out the window wondering when her mother Liz is going to arrive, but Susan tells her it probably won't be for a while yet as the plane has only just taken off. Karl is getting is doctor kit organised to head over and see Harold after Lou's call, when there's a knock at the door. Elle goes to open it, it's Mal, who doesn't say anything, but gives Susan and Karl a big shock when they turn around. They rush over to see him and give him a big hug. Tad is DJing at a local skateboarding display when the two top guys, Renton Miller and Steve McCann come over to see him. He tells them they're very impressive with their skating and BMXing, and they compliment him on his music. Tad tells them he's never got much further than Warratah Heights before, but they tell him that's all about to change. Tad tells Toadie of the offer the guys made for him to join them on a three month Extreme Tour around Australia, for which he'll get paid. Toadie asks when he's going to leave, but Tad isn't so sure if he can leave Harold at the moment. Tad knows if he tells Harold about it, he'll tell him to go, but that would leave no one to look after Harold. Toadie points out his options. TOADIE: Please yourself and feel guilty, or be responsible and feel regretful. Tad is still unsure, so Toadie recommends that he should talk to Harold, as they may be able to arrange something between them. It would seem that Mal lost his bag at the airport, but the baggage people are not being very helpful on the phone. Karl points out that it will probably turn up, it's just a case of when, but Mal worries about what he's going to wear in the meantime. Meanwhile Susan is disappointed that she wasn't able to cook up a roast, but Mal reminds her that's where the surprise works. She gives him a plate of food, but he points out he's been on a 24hr plane ride stuffing his face of food, and so passes on the offer. SUSAN: I just want to be your mummy, come on, I don't get a chance. Karl asks where Catherine is and Mal tells them they've split up and go their separate ways. Seeing the look on his parents faces, he tells them he was only joking. He tells them Catherine is busy working and he had the money, and wanted to see his family and new nephew. Darcy bumps into Terri and asks her what she's doing tonight as he has an offer. She tells him she plans to spend the night in watching the tele. DARCY: Oh, that's in the same league as ''I'm going to wash my hair''. She tells him it's a no. Tad decides that with Harold in bed, and what Karl has said, he isn't going to be able to go away for three months now. Toadie tells him it's a shame about the timing, and Tad points out that there could be another offer around the corner, though his expression is saying otherwise, and it looks as though he was quite keen to go. He realises that by sticking around he can finish off his sound course, so it's not all that bad. Darcy continues to try and win Terri over with an idea for a date, but she sees right through him and admits that she prefers her trashy American programmes. Darcy tries another tactic, but she tells him she's got to go and catch speeding motorists on the High Street, and heads off. Mal arrives followed by Karl and Susan. 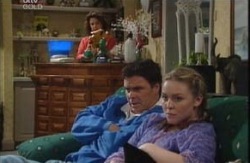 Darcy leaves and Susan goes to the counter leaving Mal and Karl to talk. Mal apologises for the lack of emails he's been sending, but tells Karl he's now working for a coffee chain called Cuppa Diem. Michelle is in a bit of a grump, and Joe tries telling her it's not all that bad, but Michelle makes out that it was the most embarrassing moment of her life. There's a knock a the door so she goes to open it. IRISH GUY: Oh, hello there, you must be the beautiful Felicity. Michelle slams the door in his face and walks off, but Lyn shouts at her. She goes to open it again. IRISH GUY: On second thoughts, this could only be the very clever and also very beautiful Michelle. Once inside Lyn asks who he is and is a little puzzled by the fact that he claims to be a friend of Jack's even though Jack has never mentioned him to them. She asks who he is again. IRISH GUY: O'Neill, Connor O'Neill, It's probably just as well you hadn't heard bout me, you know you probably wouldn't have let me through the front door if you had. Tad has told Susan and Karl of his offer, but agrees with Karl that he can't leave Harold on his own at the moment. Susan points out that it's a shame Rosie's plan hasn't worked any faster. Tad looks lost, so Susan explains about getting Harold and Lou to move in together. Phase A is complete, they just need to complete phase B, making it seem like they came up with the idea. Toadie wonders if the abrupt approach would work, and offers to talk to Lou at the pub that evening. Tad thanks him for offering and Toadie reminds him to remember him when he's big and famous. Mal wanders through wearing a pair of Karl's trousers as his have all gone missing. He puts on the shirt that Susan has been busy ironing. Darcy is on the phone to a radio show telling them where the location of today's speed camera is. Toadie and Mal arrive for a drink, but Darcy tells the barkeeper to put it on his tab and heads out the door. Mal is still annoyed that his bag hasn't turned up and is having to wear Karl's clothes. Karl bumps into Darcy doing his rounds earlier than normal. He asks how Mal is doing and Karl tells him he's in the coffee industry. 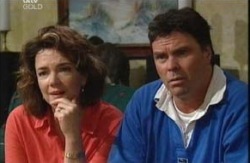 Darcy jumps to the conclusion that Mal is waiterring, and although Karl is quick to defend his son, he realises he doesn't actually know what his job is. He asks Darcy if he can cover his rounds for him, but Darcy tells him he's got a date. Toadie proposes the idea to Lou that if he moves in with Harold, Tad would be able to take the trip. Lou agrees, but isn't sure that Harold would be happy to see it as a permanent arrangement, though Toadie points out it wouldn't need to be. Terri arrives and Lou tells her there's nothing dodgy going on, but offers to her to check the place out. Darcy arrives and noticing Terri goes to complain about the parking ticket he got, but she tells him to stop fussing and read it properly. He starts to read it and although it starts off like a normal parking ticket, it ends with a sweet little comment from Terri. He tells her she's not bad herself and tries again for a date. TERRI: You may be cute but you've got a terrible memory, I'm going home to watch TV remember. Joe gets off the phone from Jack and it turns out that Connor's story checks out, and that Jack suggested the idea knowing that Connor had done some building labouring. Lyn points out that Joe is going to need some help with the business, and Joe admits a bit of testosterone around the place wouldn't hurt, for a few weeks, with the wedding business coming up. Joe suggests to Michelle that he was a nice young chap who might get her to change her mind about men. Lyn goes to set up a room for him, but notices his bag. LYN: Hey, if his name's Connor O'Neill, how come he's got Malcolm Kennedy written on his backpack? Darcy heads off and Mal considers getting more food. How much does this guy eat, all he's talked about so far is food, food, food. If he keeps going he'll be able to fit into Karl's trousers. Anyway, Connor turns up and it would seem he and Mal sat next to one another on the plane all the way from London, small world eh! Mal orders him a beer and Connor introduces himself to Toadie. Lou appears from the bedroom and it would seem that the plan to get Harold and Lou to live together isn't working that well. Toadie tells him that Tad needs this, but as Tad tries to interrupt, Toadie cuts him off again. TOADIE: I'll speak with you in a moment. (Turning back to Lou) Tell him that Tad really needs this, otherwise he's going to be giving up the opportunity of a lifetime. Do you really want Harold to be responsible for that, or yourself for that matter? Lou goes to try again. Tad isn't so sure on the idea of Harold and Lou living together, but Toadie points out that it'll help them both; Lou not being able to manage the stairs at his place (just the stairs to get to the front door at Harolds - minor point!) and Harold not being able to see. Tad isn't sure about leaving with him and Harold not on such good terms, so Toadie tells him to sort it out before he goes. TAD: You're not going to give me an inch are you? TOADIE: No, not at all, that's what cousins are for. C'mon this is your dream man, you know it! Tad realises that Toadie's right as Lou comes through and tells them it's a yes - provided he scrubs the stove after cooking meat. Tad has a huge smile on his face, and Toadie tells them it's time they started packing. Mal, Connor and Toadie are sitting around the table as Karl pours out some wine. Connor tells them his infringing on their family meal now that their son's back and so decides to head off. As he leaves, Mal gets a call, and is surprised to hear Connor's name on the other end of the phone. Harold is yelling from the bedroom to Tad, telling him what to pack. He tells him not to forget his records. TAD: Harold, they're my babies, I'm hardly going to forget them! Tad yells to Harold to go to sleep, as he mutters something in the background. Tad asks Lou if he's sure about moving in and Lou tells him not to start getting cold feet. TAD: No way, this is going to be the best, I can't wait. I just want to make sure. LOU: Tad, Harold and I wouldn't let you stay even if you wanted to. Always knew you'd go a long way, if you put your mind to it. Tad jokes that if he gets as far as Adelaide he'll be able to pop in and see Paul and rub his face in how successful he's been. Lou tells him to take care on the road, and reminds him to give Harold the odd phone call or two as he goes along. Tad tells him he's not going to forget the phonecall in a hurry and thanks Lou. He tells him if it wasn't for them, he wouldn't be going. He thanks him for being so cool about it. LOU: I won't speak for Harold, but I've always been cool man! TAD: Can you just take a compliment! Tad thanks him again, and Lou points out that it's not only going to be the three of them who benefit from this arrangement. Michelle tells Lyn she's going to go and say goodbye to Tad. Connor tells her not to be too long as she's got to fill him in on the places to go. Joe appears and drops a name tag on the table, reading Malcolm Kennedy. He asks Connor what it's about.